Gahhhhhhhh! I am not going to bore you with personal details. I will just say that I have been REALLY busy with some very important stuff that had to take priority. We haven’t gotten as far as I had hoped by this time – the halfway point of the Idita-Walk challenge. We’ve barely made it a quarter of the way. In MY defense, I have done a lot more walking than us as a team. 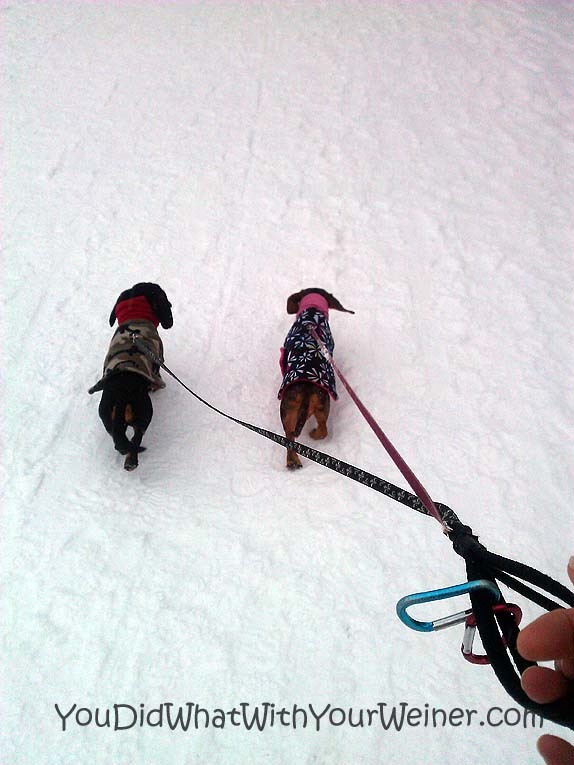 When I signed up for the Idita-Walk, I put my name down as “captain” of our wiener team. However, the rule is I can’t log any miles I walk unless at least one of Chester or Gretel are with me. On my own, I have been walking other Doxies (traitor, I know, but it’s my job) and I went running a couple of times without them. There have definitely been some positives with this challenge over the 30/30 Challenge last month. That was a good exercise to try but it really hit home that it is just impossible for me to get out and walk every single day. This challenge is great because we can walk when the mood strikes, and the stars align, for as little or as long as we want and count it toward the final goal. Boy, do we have some cramming to do though. Not to put any pressure on ourselves but we will have to walk about 30 minutes a day this month to reach 1049 minutes….so we are kind of back where we were last month anyway. I am planning for us to go on few long hikes to make up a big chunk of the time. We have been needing a few of those anyway! Now that spring is coming to the Northwest, the weather is pretty pleasant too. 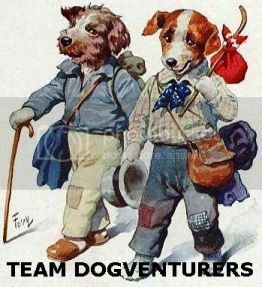 Anyway, all team Dogventurers are called to write their own review post (if they haven’t already because I am late with mine) and link up to the blog hop below. This hop will be open until Monday night PST. Loven the Idita Walk. MOM and I are up to 990 minutes. We do it when we can and sometimes for us that means it is way dark outside. Of course our weekly hiking helps a lot in the minutes. So glad to be a part of this team. It is such a nice, yet impractical idea, to say we will walk every single solitary day. We try our best, and do walk 4 days a week, on average. But…life, weather, illness, all get in the way sometimes. I will link up tomorrow. Ha ha, just chuckling now because I am exactly where you are! I have most of my post written, and will post it and link up tomorrow also. Glad I’m not the only one who will be playing catch up this month! We’ll get there, I have faith! Hey Jess, I’m sure you and the pups will be pulling ahead very shortly! Thanks for hosting this event. I’m working on my update and hope to post tomorrow. P.S. Since you have so generously allowed us commentors to attach a post here, I’ve added my only other update! Thanks again! You are so close! You have plenty of time to get yourself well. We think you are all doing really well. Our walks are not good at the moment as the whole park is just one muddy swamp but it doesn’t stop me running amok or should I say a-muck. Have a fabulous Friday. Thanks for the reminder Pamela. I tend to get focused on a goal and forget to enjoy the benefits along the way. I wouldn’t say that I a stressed about it but I could focus more on fun and less on “checking minutes off”. Don’t beat yourself up about it. Your dogs aren’t suffering and you have been getting out when you are able to enjoy yourself the most. That really should be what it’s all about. Not necessarily walking because you are supposed to but because you want to appreciate all the benefits. Even though I sometimes drag my heels about it, I am always so glad I went afterwards. I find it does even more for me emotionally than it does physically. Our post is going up tomorrow! I had a lot of personal challenges to face, too. My dad has been in the hospital for the past two weeks, which made finding walking time really tough! Sorry about your Dad 🙁 I do look forward to reading your update though. The weather is getting better and better around here so I have no doubt that is true. Awesome that you completed the challenge already! You will get it done! Mom runs first in the morning and then walks us but since we usually walk 1-2 hrs a day total, the goal was met in 2 weeks. When she has other dogs to walk, she takes us all as a pack – it has nearly killed her a few times but she hates to not include everyone. If only she had huge hands with super long fingers for all the leashes! Oh boy…..I see those two little faces looking at you accusingly as you admit to all of us that you haven’t been walking with them as a team! Sheesh! They just make us feel guilty without even ignoring us! 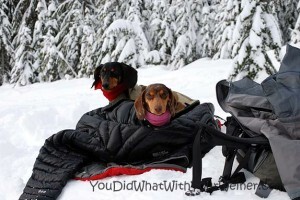 It’s just the look of disgust on their faces, those little dachsies!!! Lol! Well, actually, I got the stink eye when I tried to take Chester on a three-mile run. I am training for a race so I have only been taking Gretel when I do my longer runs. Yes, I was definitely razzing you. I just can’t get over the guilty feelings I get just from looking at their little faces if I have been gone all day and then have the audacity to leave again inthe evening! Haha. Can’t win! We are having fun on our Idita Walk. We have 650 minutes and have been enjoying our mild weather. We hope to get in a big chunk of time this weekend, since we are honoring the ‘National Day of Unplugging’ (No TV, Cell, Computer for 24 hours). Let’s Walk!! I enjoy those days too…when you unplug from everything and spend all day outside.